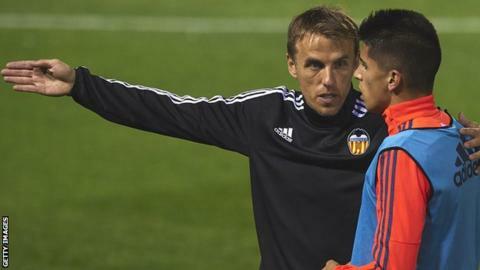 There are two strands of thought about Phil Neville's appointment as England women's head coach. The 41-year-old will undoubtedly bring new interest to the women's game and, with a playing career that yielded 59 England caps and 10 major trophies with Manchester United, will be the most high-profile England women's manager in history. It was hoped that the former England full-back would offer a breath of fresh air after the stench left by Mark Sampson's controversial exit, although Neville's tenure was less than a day old when he apologised for controversial tweets about women. Despite coaching experience at Manchester United and Valencia, he has only managed one game - for Salford City, the club he co-owns - and has no experience in the women's game. A lack of managerial nous hasn't stopped brother Gary and new Wales boss Ryan Giggs scoring big jobs, yet it represents a gamble for a team that finished third at the last World Cup and has designs on winning the 2019 edition in France. So how did he land the top job in English women's football, and is it likely to be a good appointment? How did Neville get the top job? There is no doubt Neville's candidacy came as a shock, and the intrigue about how his name emerged is fuelled by a tale about how a well-known broadcaster suggested him to FA chiefs as a joke remark at a Christmas party. That aside, questions remain about how the recruitment process worked and the part played by FA technical director Dan Ashworth, who has been removed from dealing with "non-technical" issues with the women's team. That followed his part in the Eni Aluko affair and his failure to check the safeguarding report on Sampson's background when the Welshman was hired. Ashworth was involved in the recruitment again this time - so how did he and Baroness Campbell, the FA director of women's football, go about matching Neville to the role? Did he even apply for it? One thing is for sure: Neville's route to the job was cleared once other, arguably more qualified, candidates had dropped out. Managers of the two leading Women's Super League clubs - Chelsea's Emma Hayes and Manchester City's Nick Cushing - both decided to stay with their clubs. Other contenders, such as former Arsenal manager Laura Harvey and British-born Canada coach John Herdman, got new jobs. The FA said interim manager Mo Marley "did not wish to be considered for the role", while former Watford and Estonia boss Keith Boanas did not apply after previous applications were rejected. The reasons for so many drop-outs included concerns about facing the sort of media scrutiny that Sampson encountered, and the FA's procrastinations over those it interviewed - understood to be Cushing, Harvey and Herdman. Hayes argues that leading England "is not the glamour job it once was" because top clubs can pay managers similar salaries and offer more frequent coaching. "At clubs, the competition is high, you have weekly matches and for some of us younger managers, the thought of playing quite irrelevant qualifying games, no disrespect, is not necessarily the greatest challenge," she says. So what are Neville's credentials? Neville, who has a Uefa Pro Licence and lives in Valencia, where his son is at the club's academy, managed Salford City for a solitary game against Kendal Town in 2015. Salford City won 2-1. His first coaching stint was as an assistant to England Under-21 boss Stuart Pearce in their doomed 2013 European Championship campaign, before joining David Moyes at Old Trafford, where he lasted the 2013-14 season despite the Scot being sacked. He was appointed Valencia coach in July 2015, but left the La Liga club soon after brother Gary was dismissed following a run of three wins in 16 league games. Former Everton team-mate Leon Osman agrees that Phil Neville, whose sister Tracey coaches the England netball team, is untested in management, but believes he will be a success. "He's got a vast amount of experience of the men's game, he's represented his country many times and won trophies, so he's coming from a strong position," Osman tells BBC Sport. "Yes, he doesn't know the ins and outs of the women's game but he's adaptable and I don't think it will take him long before he's memorised every player who's currently playing in all the leagues." Former England goalkeeper Rachel Brown-Finnis adds: "This is a someone who has worked under Sir Alex Ferguson and is from a group of players who have lived with a winning mentality their whole careers. "That is something which this team has never had and needs to take it to the next level - a leader who knows what that looks like." What does the appointment say about women's football? The view from some inside women's football is less positive. England and Chelsea midfielder Katie Chapman says: "Surely there must be coaches out there who've had a lot more experience in the women's game, and of actually being a manager?" Another top coach in the WSL told BBC Sport they hated that women's football had to "settle" for an untested Neville. Only last week, former Leeds manager Neil Redfearn was hired by Doncaster Rover Belles, showing that experienced managers are willing to make the move, but some in the game are questioning if Neville is disrespecting the job by using it as a stepping stone to further his career. It also highlights an ongoing issue in women's football - a lack of top female coaches. Only three of Women's Super League 1 clubs are managed by women. As London Mayor Sadiq Khan said when speaking about gender equality in all sectors last week: "If you can't find talented women to fill jobs, then you're mixing with the wrong people." Undoubtedly, there will be a lot of coaches in the women's game who will be watching Neville very closely. Despite reservations about the recruitment process, there is still a buzz about the appointment. Players are excited to see what he can offer and, after accusations that Sampson had his favourites - shown by picking his Euro 2017 squad three months early - Neville could open the door to those who previously believed it was closed. Osman, who played alongside Neville for eight years at Everton, says: "The players will definitely respond to him, not only by what he's accomplished in the game but his enthusiasm is infectious." Cushing, who moved from the Manchester City's men's academy team to take charge of the women's team in 2014, says the transition will cause few problems. "As coaches, all we want is players that are really hungry to improve, and there are plenty of them in this league," he says. Brown-Finnis adds: "He will learn that managing females can be different to males, but I'm sure he will have people around him who can help him with that and lean on to get advice, and his sister is one of the top female coaches in the country." There's an uncanny timing in Neville being named England women's boss a week after Ryan Giggs was made Wales manager. In Neville's case, perhaps he will have more time to suss out the job, given that most of the 2019 World Cup qualifying games will not overly test the team - except maybe Wales, whom they face at Southampton on 6 April. However, there is the SheBelieves Cup, which starts on 1 March. The Lionesses will face France, Germany and the United States, giving Neville an instant taste of the level his team must reach if they are to win the World Cup. The word is that Neville's coaching credentials are sound. But Osman says: "My only question is whether he'll be able to put that barrier up that sometimes you need in management. He will have to leave people out and the buck will stop with him. "I think he will be able to do it, though. He's a very single-minded person and good coaches can become good managers."